I’m taking some time off this week, so there’s no new lesson in our Women of Genesis Bible study. But take some time to study these verses – often misused for the 4th of July – about our freedom in Christ. Independence day is my favorite of the non-major holidays. Fireworks, picnics, barbecues, and what other holiday has such grand music that nearly the whole country can enjoy and sing together? It’s the one day of the year when we, as Americans, can set aside our political differences and bickering and celebrate our God-given freedom to have political differences and bickering. It is good to thank God for the blessing of liberty. It is right to be patriotic and celebrate our nation’s founding. It is evangelistic to use Independence Day as a springboard for explaining to people how they can find real freedom in Christ. And with that freedom – our freedom in Christ and our freedom as American citizens – comes great responsibility. Namely, the responsibility not to throw all of those things into the Cuisinart at once and turn them into an Americhristian smoothie with red, white, and blue sprinkles. There is a vast difference between American political freedom and the spiritual freedom found only in Christ. But when we lift Bible verses out of their context and stick a flag behind them in celebration of Independence Day, we conflate the two. Weaker brothers and sisters in the faith who already muddle American citizenship with heavenly citizenship are further confirmed in their confusion. We should be making these distinctions clearer, not encouraging their commingling. Yet this is exactly what happens on Christian web sites, social media, and even in our churches as the 4th of July draws near. Sisters, this should not be so. None of the verses in the Bible which contain words like “freedom” and “liberty” are referring to American political freedom. None. The verses containing these words are usually speaking of freedom from sin in Christ, freedom from Mosaic Covenant law, or freedom from literal slavery. We must use and understand them in context, or we are doing violence to the text and treating God’s holy Word with apathetic irreverence. Here are the top 10 Scriptures I observed being twisted on the 4th of July. Most of the memes using this verse omit the first phrase, because even including those six extra words tends to give too much context to the verse for the person trying to make it about American freedom. If you read all of chapter three, or even just verses 12-18, you can see that this verse is about being set free in Christ from the demands of the Mosaic Covenant. Although 2 Corinthians 3:17 was misused by many, the first place I saw it was was from Lysa TerKeurst’s Proverbs 31 Facebook page – emblematic of why Christian women should not receive Bible teaching from anyone associated with this organization. Most incorrect citations of this verse include only its first phrase. Indeed, Christ has set us free for freedom, but freedom from what? English tyranny? Political oppression? No, as the rest of the verse goes on to say, Christ has set us free from the yoke of slavery to the Law. In Christ, we are free to stop striving to be good enough to earn right standing with Him, and to rest in His finished work on the cross to clothe us in His righteousness. That’s way better than American constitutional freedoms because that kind of freedom is available to anyone, in any country, at any time in history who repents and places her faith in Christ for salvation. This is a great verse that Christians can live out in service to our families, our church families, and even our fellow Americans. But we need to understand that when this verse says we were “called to freedom” it’s not talking about the rallying cry of the American Revolution. The freedom we were called to – as with Galatians 5:1 – is the freedom from striving to obey the Law to obtain righteousness. But just because we’re no longer under the constraints of the Law doesn’t mean we can go out and sin at will, or indulge the flesh by doing whatever we feel like doing. That’s antinomianism. Instead we’re to use our freedom from the Law as an opportunity to deny self and serve others. I’ve written at length on this verse in my article Is 2 Chronicles 7:14 God’s Promise to American Christians Today? The short answer is “no,” it is not about America. Although there’s plenty that Christians can learn from this verse, it is a promise to Israel, as the surrounding context clearly indicates. Even adding just two verses (34-35) to this one give enough context to help us understand that Jesus is talking about being freed from slavery to sin through the salvation only He can provide – the salvation that is about to cost Him the agony of scourging and death on a cross. It is appalling that this verse – spoken by our Lord Himself, about the earth-shattering, awe-provoking amazingness that is the forgiveness of sins by the grace of God in Christ – should be so lowered and sullied as to try to make it refer to American freedom. The context of this verse is similar to Galatians 5:13 (#3 above), but it adds a couple of extra facets. If you read verses 9-17 of 1 Peter 2, you’ll notice the same instruction to live as people who have been set free in Christ and to use that freedom in Christ to serve others. Why? “…So that when [the Gentiles] speak against you as evildoers, they may see your good deeds and glorify God… For this is the will of God, that by doing good you should put to silence the ignorance of foolish people.” (12,15) When we use our freedom in Christ to serve and do good, it is a testimony of the gospel to the lost. This passage also exhorts us to be subject to our government and our political leaders. And if you know anything about the first century Roman Empire, you know its Christian citizens (Peter’s audience) knew nothing of the political freedoms American Christians experience. In the immediate context and application of this verse, “nation” and “the people” is referring to Israel. Examining verses 10, 16, and 17 alongside verse 12, it’s a safe assumption that the psalmist had observed some part of Israel’s history that included war against neighboring nations. And, certainly, any Old Testament Scripture referring to the people God “has chosen as His heritage” could only be speaking of Israel. America didn’t even exist at that time, nor has God, at any point in Scripture, said that America is His chosen people or His heritage. If you want to think of a New Testament “nation” or “people” God has blessed and chosen as His “heritage,” that would be the church- the worldwide body of born again believers. While, ostensibly, any nation whose God is the Lord would be blessed, we have only to look back at Old Testament history to see how unlikely it would be for America’s God to be the Lord. Israel was God’s chosen people and heritage. They were “the nation whose God is the Lord”- literally. They were a theocracy – under the direct rule of God Himself – yet they rejected Him in favor of earthly kings and repeated cycles of idol worship. And we think America is capable of becoming “one nation under God”? It’s pretty easy to see why only the phrase “proclaim liberty through the land to all its inhabitants” is lifted out of this verse. It is obviously talking about Israel’s Year of Jubilee which has never been practiced in America because we are not, and never have been, under the Mosaic Covenant. Even Israel doesn’t observe the Year of Jubilee any more. The use of this verse is simply a case of someone looking for a Scripture to attach to a patriotic meme, doing a concordance search for the word “liberty,” and whittling away everything in the verse that is obviously un-American. Except for the fact that this verse includes the word “liberty” or “free,” depending on your translation, it’s incomprehensible to me that anyone would see this as a verse to use in the celebration of Independence Day. This verse doesn’t even make any sense when applied to America. It’s not about a country, it’s about a person: Jesus. Jesus spoke these words. He’s quoting Isaiah 61:1-2, which is a prophecy of the Messiah to come. If you read a mere three more verses of Luke 4, you’ll see in verse 21 that Jesus says, “Today this Scripture has been fulfilled in your hearing.” Meaning what? Jesus is saying, “You know that Messiah you’ve been waiting on for centuries, Israel? I’m it. I’m here.” And the liberty or freedom He’s talking about? Once again, it’s freedom from sin and freedom from the Law. Because that’s what Jesus came to give us. Nope, this one isn’t about American political freedom either. A couple of things to notice: first, this is clearly set in the context of Israel’s Old Testament history, as verses 2-3, with their references to “Israel” and “Aaron”, indicate. Next, look at the personal pronouns, not only in verse 5, but also in verses 6-7: “I,” “me,” “my.” This verse is not about America being set free from England, or even about Israel being set free from one of its enemies. This is a descriptive passage about an individual – the psalmist – being in some sort of distressing situation, and God answering his prayer for deliverance. Have you ever prayed that God would deliver you from a difficult time in your life? If He did, do you think that unique situation is applicable to anyone else, much less an entire country? This passage is kind of the same thing. The psalmist is sharing something God did for him, not commenting on politics or even assuring other individuals that God will do the same for them. Memorial Day is a solemn and precious day to honor those who have laid down their lives for our freedom as Americans. Every male member of my immediate family has served or is serving in the military, and I know just how blessed I am that they have all returned safe and sound. It takes a special kind of person to make the ultimate sacrifice for his country, and I certainly don’t want to take anything away from that. But as meaningful as that is, it can’t – and shouldn’t – compare to Christ laying down His life to make sinners His friends. And that’s what this verse is about. For twelve verses, Jesus has talked to His disciples about abiding in Him because He loves them so much. In verse 13, He talks about the proof of His love for them: He’s about to give His life as the atoning sacrifice for their sin. He wants them to love each other the same way – that for Christ’s sake, in Christ’s name – they would be willing to die for the sake of the gospel. Eleven of the twelve of them would go on to do so. When we use this verse in reference to Memorial Day – as deeply consequential as that day is – it tarnishes the infinitely more important sacrifice of Christ by comparing a mere man’s offering of his life for temporal, earthly freedom, to God’s offering of His sinless Son to purchase for eternity the redemption of sinful rebels. I’m proud and grateful to be an American. I’m thankful for this nation and the freedoms we have as citizens. But for everyone who’s a citizen of the Kingdom of God, our loyalty and reverence must lie with Him first and must surpass all other loyalties – to family, to friends, and even to country. That means we reverence God’s holy Word by being good students of it and handling it correctly, by preserving and standing up for its meaning and intentions, and by refusing to manipulate it for our own lesser purposes- even such a noble purpose as patriotism. The references below are for the purpose of photo credits only. I have not examined most of these sites and do not endorse any which contradict my beliefs as cited in the Statement of Faith and Welcome tabs at the top of this page. Was the American Revolution a violation of Romans 13:1-2? (Keep in mind Paul wrote this in Rome under the rule of Nero, who mercilessly persecuted Christians- much worse than anything the colonists experienced.) Should the American colonists have simply submitted to King George? Imagine you’re a pastor in the early to mid-1770s. Many of the political and planning meetings for the Revolution took place in churches. Do you, as a pastor, allow such meetings to take place in your church, considering that the the Revolution might be a violation of Scripture? Feel free to share your thoughts in the comments section (The usual comment parameters apply. ), and catch up with the comments on Facebook here. 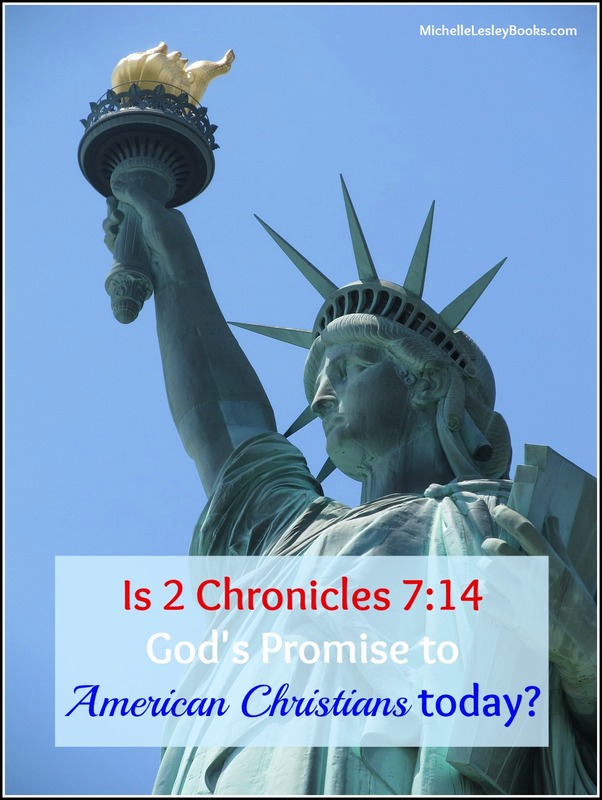 Throwback Thursday ~ Is 2 Chronicles 7:14 God’s Promise to American Christians Today? Is 2 Chronicles 7:14 God’s promise to American Christians today? This verse is often quoted as a call to prayer and revival for American Christians, suggesting that if we pray, repent, and humble ourselves, God will turn America around and make it “one nation under God” again. Since it’s 4th of July week, you’ve probably been seeing this verse in your news feeds, but is it really a promise to us today about America? Photo courtesy of Please Convince Me. 1. This verse is only part of a sentence (you can tell by the way it starts with a lowercase letter). In order to rightly handle God’s word (2 Timothy 2:15), it’s imperative that we consider a verse’s immediate context as well as the way it fits in with the big picture of the entire Bible. Even adding just verses 13 and 15 shows us that this verse was written about Old Testament Israel, not America. Reading all of chapter 7 sheds even more light on this verse, and if we throw in chapter 6, especially 6:26-31, we can clearly see that 7:14 is part of God’s specific answer to Solomon’s prayer at the dedication of the temple. 2. There are no supporting Scriptures in the New Testament (remember, Believers are in the church era under the new covenant of grace) that imply that if Christians humble themselves and repent that God will give them a nation governed by biblical laws and leaders and that we will have a society that behaves itself, morally. In fact, in the New Testament, in the early church, we see the exact opposite. The more the church prayed, humbled itself, and spread the gospel, the more Rome persecuted Christians. And yet, we never hear of them claiming 2 Chronicles 7:14 as God’s promise to them that He would turn things around if they would only humble themselves and seek His face more. The New Testament, even Jesus Himself, says that we will be persecuted for godly living (John 15:20, Matthew 10:22, 2 Timothy 3:12-13). 3. We can’t claim the promise without claiming the punishment. Look again at verse 13. It specifies that the agricultural hardships of drought, locust infestation, and pestilence are the ones that God promises to heal. It is a promise of literal healing of the land so that crops will grow unharmed, game will be plentiful, and people will be able to eat, not a promise of a metaphorical “healing” of a nation’s immorality. If we claim that this “healing of the land” applies to us today, then we also have to claim that God will punish our disobedience with those very things He promises to heal (drought, locusts, and pestilence), because that’s what these verses are talking about. Does God promise to heal our land of bad morals or the agricultural problems He has punished our disobedience with if we do these things? No. Asking God to fulfill His promises and thanking Him for those already fulfilled is a wonderful and worshipful way to pray. But, if we truly want to pray “in the name of Jesus” and pray rightly for God’s will to be done, we must use wisdom, discernment, and the tools God has given us to discover exactly what He has promised us. In Case You Were Wondering: Is 2 Chronicles 7:14 God’s Promise to American Christians Today? “In Case You Were Wondering” is an ongoing series examining challenging questions about the Bible and Christianity and providing biblical answers. You can read previous ICYWW articles by clicking on the topic in the category cloud to your left.